AURORA, Ind. 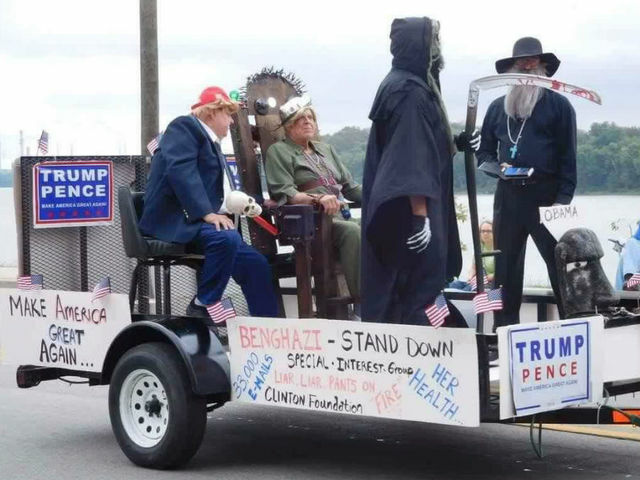 – Residents in Indiana are up in arms over a parade float Saturday that depicted Donald Trump throwing the switch on Hillary Clinton in an electric chair and President Obama as a Easter Island figure with an oversized head. Float depicts Trump throwing switch on Clinton in electric chair; Obama as Easter Island figure in black face. 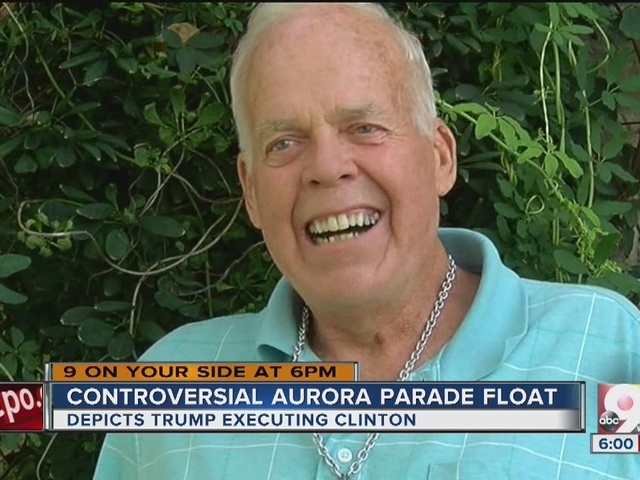 A public protest started when an Aurora mom posted a photo of the float on Facebook and condemned it as sexist and racist. Most commenters agreed with her, but others defended it. "Who thinks this is appropriate for a fair parade where children, some of them minorities and girls, are marching and playing instruments and watching? Who thinks this is something to laugh at or be proud of?" Penny Britton said on her Facebook post. "This is disgusting. This makes me embarrassed to say I live here. This is Aurora, Indiana. Congratulations." The float was part of the Aurora Farmers Fair Parade Saturday morning in the small Ohio River town 35 miles west of Cincinnati. It's sponsored by the Aurora Lions Club, according to its website, and touted as Indiana's oldest street festival. The theme of the parade was "Celebrating the Past, Embracing the Future." According to the Rules & Regulation on the website, Fair officials "reserve the right to reject or evict any entry from the parade line-up that they deem unsuitable." On Monday, the trailer holding the float was in the driveway of a man named Frank Linkmeyer. A Lions Club board member, Tom Scott Petty, told WCPO the organization was not prepared to make a statement. The parade manager listed on the website, Michael Feustel, did not return our call. Ashleigh Mizbear When you showcase racism and bigotry and sexism and allow it you are saying it's ok. When you say 'nobody got hurt' you are saying it's OK. When you negate the message because it doesn't effect you, you are saying it's ok.
Lisa Polak So glad I didn't see that. 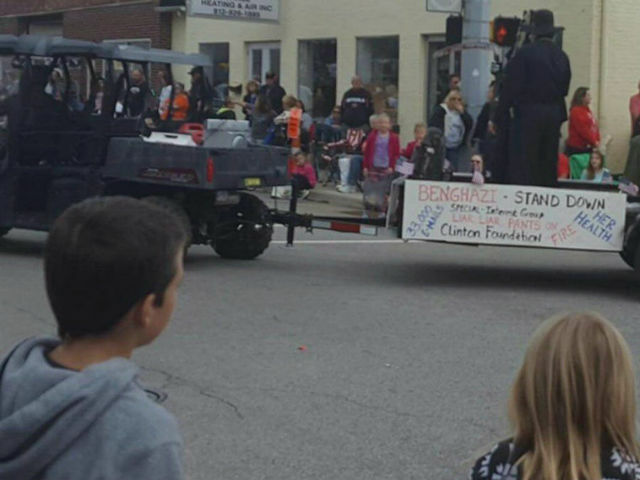 That's disgusting and to think our town administration thought the float was acceptable. It's so scary to think what our kids are going to have to live with. One commenter posted names and phone numbers of the parade organizers; others called out city officials. Billy Brothers Are you people serious? It's a parade float not the end of the world. THIS doesn't represent who we are at all, your actions do. Last time I checked I don't associate with anyone racist.. does that make me a good person? Not at all because everyone is entitled to their opinions, wither it be right or wrong. Including you, I personally think you've gone overboard. What will making several angry phone calls accomplish?? Nothing, so sit down and calm yourself. There will always be good and bad people in an area. It's up to you however to determine what group you associate yourself with. Christopher Lee Powell Where is racism and sexism in the posted picture above? Four people dressed in costume played the roles of Trump, Clinton, The Grim Reaper and a clergyman (from "The Exorcist?). The float bore Trump-Pence campaign signs and a few handwritten pro-Trump, anti-Clinton messages. One repeated the Trump mantra, "Make America Great Again" and a larger one said "Benghazi – Stand Down."